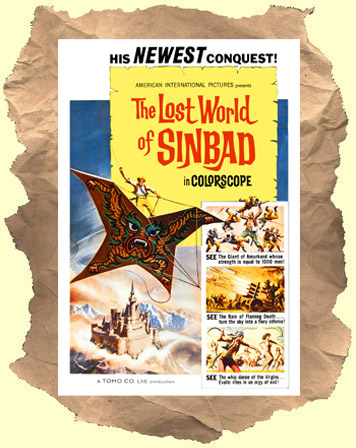 SYNOPSIS: Toshiro Mifune stars as Sinbad in this special effects and action packed fantasy adventure. The plot kicks in with a princess who is tricked into marriage with the evil Premier who wants to take over her kingdom. He enlists the help of the dreaded Black Pirate to help him. Sinbad finds out about this plot goes to save the princess and get back a chest of gold and riches that the Black Pirate stole from him. His adventure leads him to a showdown with the bad guys at the Premier's castle. You also get a witch, a wizard and a good dose of humor. Mifune is great as usual and it's nice to see him do something in the fantasy genre. Plus the supporting cast is filled with familiar, and reliable, actors. All the costumes and sets are first rate as well as the exotic locales. Dubbed in English. Fans of Jason and the Argonauts, Arabian Nights and Russian fantasy films will want to check this out. WIDESCREEN.